I have to pat myself on the back for forging ahead with my gift knitting in spite of being so scatty about it. Well, I have to, but I can't, because the forging ahead is keeping my hands occupied. Just not on one pair of needles at a time. For example: the other day I got super close to finishing the Candle Flame Cowl, but then I put it aside and started a Turn A Square hat by Jared Flood. I've always been intrigued by the simplicity of this design and the promise of jogless stripes (you know, where it's not brutally obvious where you started a new round every time you change colours) and it's nice to finally be able to give it a go. Of course, nothing is simple: the yarn I wanted to use is totally the wrong weight, so I had to recalculate gauge and cast on an entirely different number of stitches and guess at how far to go before starting the crown decreases. Also, the needles for the ribbing were currently in a certain pair of socks I shouldn't have started. at which point I got tired of knitting it. I should have put the now-finished sock needles to work casting on a pair of gift slippers but somehow they wandered back into the socks and went through another round, sigh. Meanwhile that cowl was still sitting there with about an hour of knitting left in it. What gives? after getting the cowl almost through its castoff. Almost = right to the last stitch where you cut the yarn and pull through. Seriously. 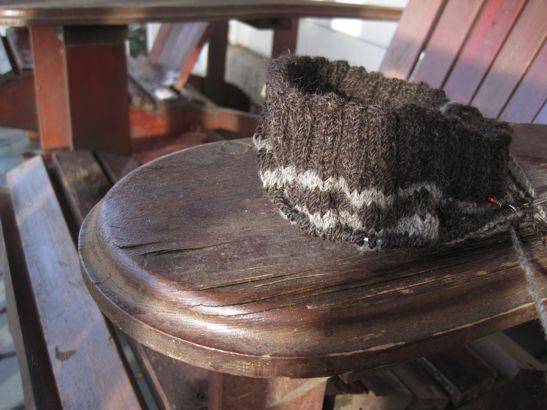 I put the cowl down rather than snip yarn and pull it through, to go back to a hat. I don't get it! 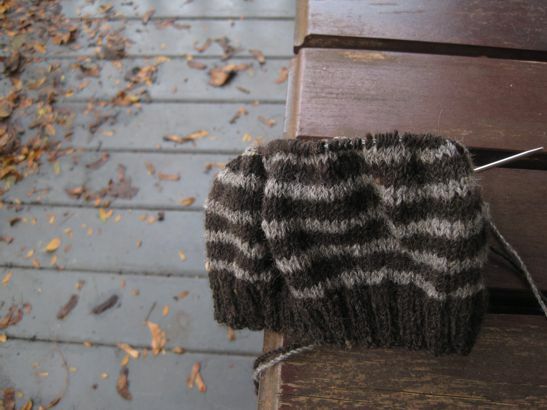 On the upside, the hat goes a lot faster than you think it will, even with small yarn. And the stripes are looking nice. I'll show you more pictures with all the gory yarn and adaptation details next week - but in the meantime, have a delightful and productive weekend. See you! gahhhh.....I absolutely do the same thing. That's why there are about 15 projects on the needles (I have a lot of needles, too) over the past years. I seem to be staying with the shawls I'm making lately, as there is a severe deadline (Thanksgiving and now, my Mother) so I'm staying with those. I tend to travel thru projects when the intensity of knitting has to match my mood.